Copyright© The California Department of Water Resources. Courtesy of the UC Berkeley Digital Library. Used by permission. 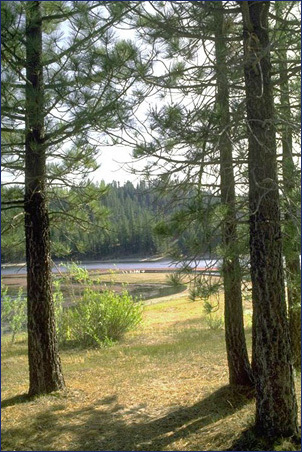 Scenic view through trees of Antelope Lake in the Central Valley Region. This photograph was taken in June 1992 and is part of a collection of 17,000 images of California's natural resources from the California Department of Water Resources. As part of its research efforts, the UC Berkeley Digital Library Project has been assembling a large collection of data pertaining to the California environment. The primary types of data are terrestrial photographs, aerial photographs, geographic data, species databases, and documents. These are sizeable collections (currently totaling about 0.5 terabytes). Included under each type are subcollections that are extensive and valuable in their own right, and especially useful together. For example, the CalFlora databases contain hundreds of thousands of "occurrence records" (i.e., actual sightings) of 8,363 California vascular plant taxa -- by far the largest such collection available. One of the photograph collections contains thousands of classified images of California plants. The collection of geographic data includes high-resolution maps and imagery of important areas of California, as well as watershed locations, and street and geographic boundary information. The collection of documents includes a large collection of scanned information from various California agencies and organizations, including, e.g., the county general plans of all the counties of California. Thus, a researcher might access the CalFlora database to compute a distribution map of a given species, contrast this with other geographic information, and then consult the repository for relevant textual information. Each data type has access methods and related technologies of its own, and most are growing continually, with efforts to federate with other collections. Much of the plant (and more recently, animal) images are of interest to the layperson, as are the geographic data sets. You are welcome to explore the collections and associated technologies (all under development).